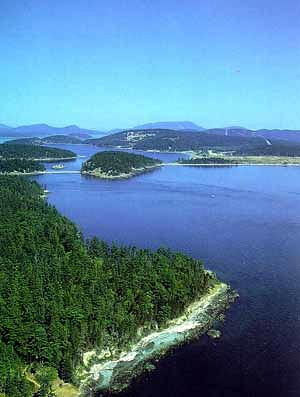 Living up here in the Pacific Northwest, I get the enjoy the beauty of the San Juan Islands. If you ever come up here, I highly recommend it. You could be on a boat, take a ferry or even fly over the islands in a seaplane. Why am I talking about islands when today’s topic is Red, like mountains. The real saying of this title, “Red Sky at night, sailor’s delight; red sky in morning, sailor’s warning” is a old sea tale, right? Well, it’s mostly true. Having been boating in the area, we can decide whether we should stay out of the weather or go to a new place. What does this have to do with Planar Chaos? Well, I needed a Red pun, and I already used Communism last week. Plus, I like to show off my home state. It’s Washington. Just helping you out Tourist board. Usually when Red gets small efficient creatures, there’s a drawback. Having first strike and protection from a color with great combat tricks, isn’t really a drawback. What gives? Well, both abilities have been seen in Red, but here’s the deal: when it comes to cycles (as this can be seen it) sometimes it’s alright to break the rules slightly (slightly). Verdict – It’s alright for now, but don’t expect to see it everyday. A combat trick, yes, but what does this have to be with Red. Red usually gets Firebreathing, not just toughness. Well, when you play something as an instant like this, it can be seen as an emotional response of attacking or blocking (ah, that emotional bit again). Plus, you could have saved that +3/+3 to make it an enchantment instead of playing as an instant (if you, per say, could do that, but it’s the sacrificing the future aspect I’m trying to get at). Here’s the problem I have: I understand that sometimes flavor of a card wins versus what a flavor of a card can do. I’m going to be talking about this in a few weeks, so I won’t bring up the who thing here. Red shouldn’t return things from the grave. Yes, it’s a bird on Fire, so it’s Red. But, I still have a problem with cards like this. Verdict – Beh! No es bueno. Timmy! You’re not supposed to be Blue. Put on some Red clothes. Ah, there we go. Verdict – Uh, yeah. This should have been Red years ago. What the interesting thing about this card is that you need creatures is play (that’s what’s know as a virus). It does damage, so it’s Red, but it requires a creature inplay to get full use out of it. So, being Red, if you want the full use of the card, you have to sacrifice the future; which, as I’ve said, Red. Verdict – Yes! Wait, I’m on fire! Help, help! Trample was seen as something Red can do in Planar Chaos, which makes sense, but not seen very often. Of course, the real bonus of this card is the Madness cost. One of the ways Red tries to gain an advantage is by discarding cards sometimes, and Reckless Wurm likes to take advantage of this. I see this as a Red card because it’s not spectacular if you pay for it normally, which its drawback is that you have to discard it, another drawback. Verdict – Sure. But I don’t think we’ll see madness for a while again. Red likes to destroy things, so this card can fit in Red’s piece of the pie. But the drawback (aw, there’s that word again, especially useful with big creatures) is that you may not be able to play it if it destroys things. Red loves this card. Giving up future for the now, for fast mana? That doesn’t sound like Red at all (That’s sarcasm, if you couldn’t tell). Red has this ability to not let creatures block, so this is just an extension of that ability. Instead of picking out certain creatures that can’t block, it’s certain colors that can’t block. Yes, in that sense, “Red Fear” works. Hope everyone has a good weekend, and have fun at their respective prereleases. If you’re going to the Seattle one, find me and say hi. I’ll be wearing a M:tG Color Pie shirt (hopefully if I can get it finished in time), or a Seahawks Joe Jurevicius jersey. Say hi, I’ve got some trades, and of course, my Highlander 150 deck.